What a difference even an unpopular US president can make. Israel’s prime minister Benjamin Netanyahu made his first phone call in four years to his Turkish counterpart this afternoon. During the 30 minute conversation, he apologised for Israel’s role in Mavi Marmara incident and agreed to discuss compensation for the families of the nine Turkish victims. Both sides are to send their ambassadors back at once, reports suggest, a move which would restore full diplomatic relations. Mr Netanyahu also made a number of overtures on the entry of civilian goods into Palestinian territories, an issue about which Mr Erdoğan has been vocal. 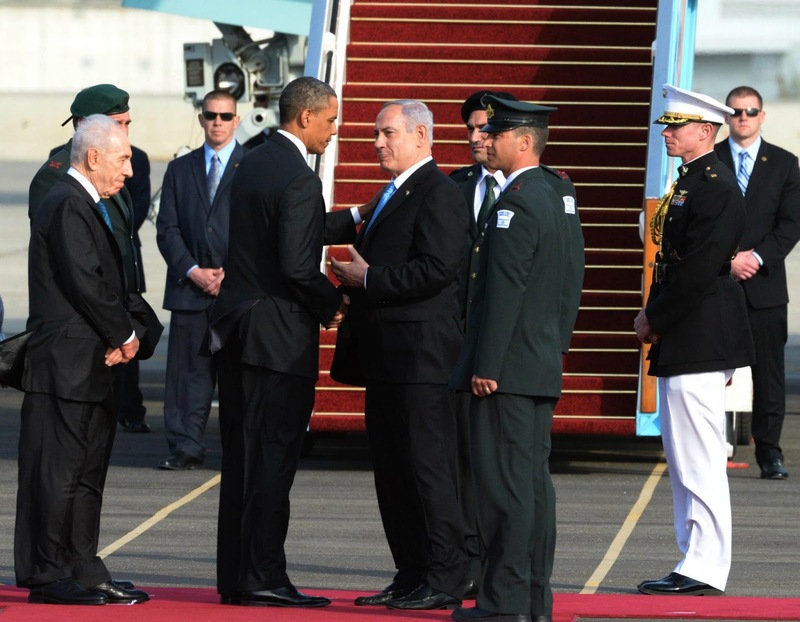 Barack Obama’s role in making the phone call happen appears to be pivotal. As always with these things, the precise language is important. Israeli national security advisor Yaakov Amidror and Feridun Sinirlioğlu, who as undersecretary is essentially the man to know at Turkey’s foreign ministry, had met in Rome recently to thrash out a form of words both sides could agree upon – but they failed. The task clearly fell above their pay grades. So it is curious that the precise terms of this apology are somewhat ambiguous. According to Haaretz, Mr Netanyahu “expressed his apologies to the Turkish people for any error that could have led to loss of life”, according to Haaretz quoting the Israeli prime minister’s office. That is roughly the form of words used in the English press release put out by Mr Erdoğan’s office – they use “mistakes” instead of “error”. But the corresponding statement in Turkish says Mr Netanyahu “expressed Israel’s apologies to the Turkish people for all mistakes that led to loss of life or injury” (translation and emphasis my own). 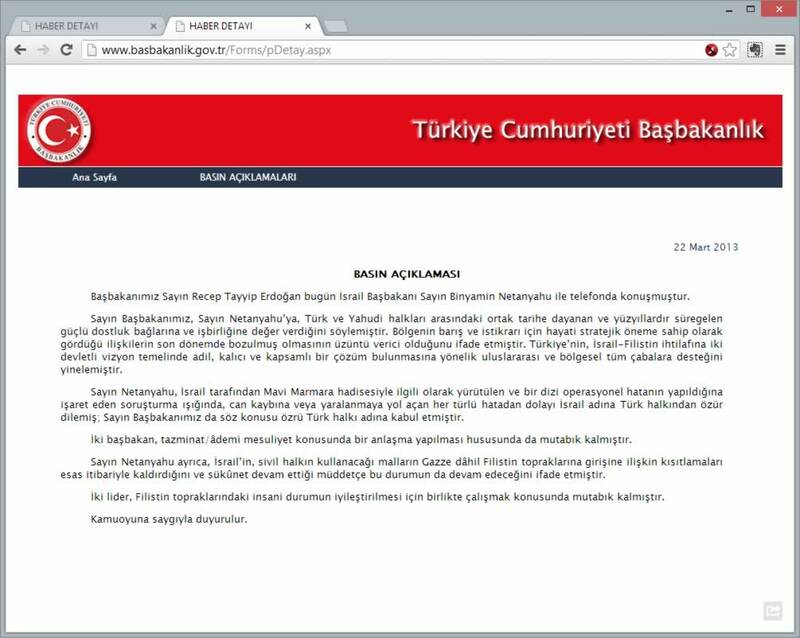 The Turkish version says there were errors in the Mavi Marmara mission and apologises for them all. Haaretz’s quotation suggests the question of whether there were errors is not settled, but offers an apology if any were made. It quite neatly represents both countries’ positions on the incident: Turkey believes the Israeli Defence Forces were entirely at fault and demanded a complete apology; Israel says it did some things wrong, but that its forces were provoked. If Haaretz’s quote accurately reflects Israel’s position – the Israeli prime minister’s website is offline at the moment – then it seems Turkey and Israel made their peace today by saying kind words to each other but without changing their minds in the slightest. But this should not detract from the importance of what happened this afternoon. When Israel and Turkey last enjoyed full diplomatic relations, Hosni Mubarak was still president of Egypt, Muammar Gaddafi was leader of Libya and Syria was a stable country. The Arab spring showed everyone how important it is for the Middle East’s two strongest democracies to get along with one another. Now, finally, it looks like they might. 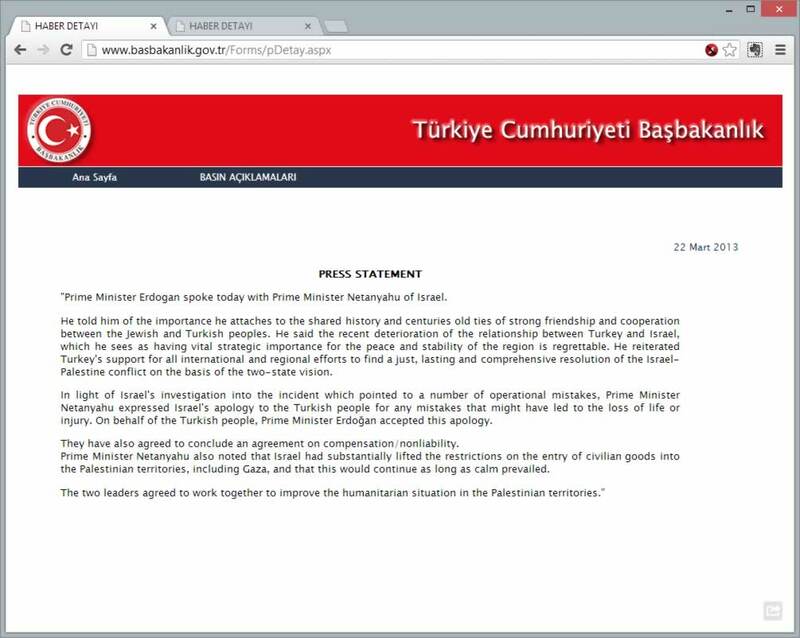 UPDATE 8.02PM: The Israeli PM’s office is still offline, but the Turkish PM’s website has been updated to include separate statements released by Turkey and Israel. The “any error / all mistakes” discrepancy described above remains in place, however.